Well, its either that.... doing a cheap something to get some hp from the 2.7 or possibly a turbo engine swap.... anyone have any suggestions? What 2.7 and what year is the engine? Standard USA 2.7, 2.7 S, or 2.7 RS? First thing to do is get rid of the exhaust system and bolt up either pre '74 heat exchangers or SSI heat exchangers. You'll also need a new muffler. This should get you at least ten more horsepower. Secondly, maybe you could advance the timing. I think anything after that, and you're looking at opening the engine up to do modifications, which, as you can imagine, will cost lots of money. It depends on how much power you really want. Here is a motor I built for my wife. It is a 76 2.7. I did P's and C's with a little bump in compression, cams, SSIs, muffler, mild head work and a modified fuel head. The car doesn't make a ton of power, but it is VERY drivable and quick. It weights nothing and has a broad TQ band. The fun factor is great. It will out run a new 350Z pretty easily I can tell you that. Stephen - what are the specs on that 2.7? And does that dyno run show rear-wheel horsepower? 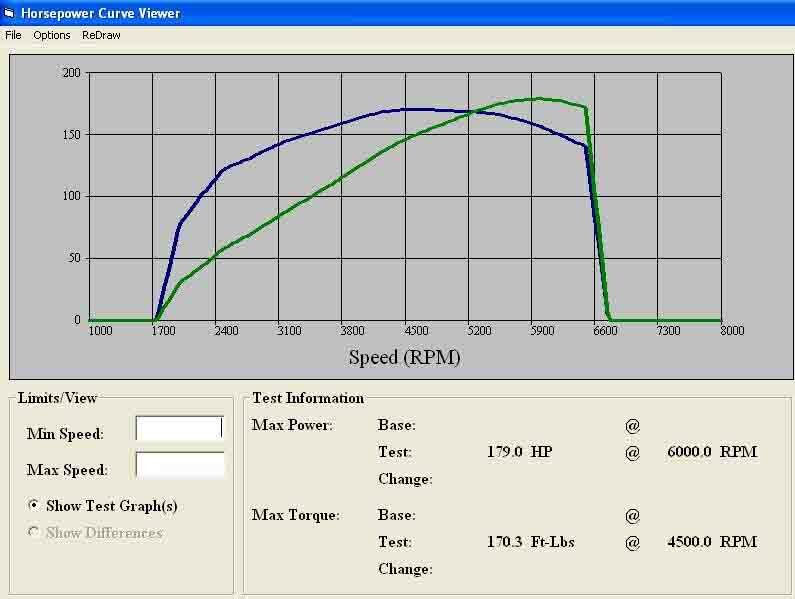 I have to have our staff meeting and will give all the specs here in a bit, but yes it is wheel HP on my dyno. I replaced the case with a 2.0 case. I used a set of JE pistons and Mahle cylinders. Dry lube on the skirts and the ceramic coating to the crowns. The whole assembly was balanced as well. We did some pretty extensive head work in the area of flowing to make sure they would move the air quickly through the ports. Some Vmax Springs and a cam that is very similar to the SC. The cam is closer to the 330 Sport than the SC. But they are all very close in characteristics. We used this since the compression was high enough to get it moving. I didn’t want the motor dieing out too quick. The powerband is very usable which was the overall goal. I then fitted it with SSIs and a muffler. Overall I am very pleased with the results. I imagine I could get bigger numbers out of it but the goal was to ensure the fun factor. I didn’t bump displacement due to the small increase and nothing makes more of a difference than the details like the heads. These are often overlooked and or done improperly. The seats are often to low and flowing is often forgotten. As most of your work that I've seen, nice looking engine Stephen. BUT and I have two buts here: For someone other than Stephen or others like him, this isn't a easy or inexpensive "mod". Second thought that is on my mind, and one I bet Stephen will agree with, is that if your truely desiring "turbo" power...no 2.7 NA will satisfy you. CA, right? So do you need to be smog legal for the 77? I would be tempted to suggest a nice used set of carbs or Tbitz, JE pistons (if you aren't unlucky enough to have Alusil's) and good camshafts with SSI's. If your willing to loose some streetability I think you could move the power curve up and to the right. Yes a 1977 need to be smogged, damn it's time for that again, thaks for the reminder... lol I was thinking of an easy way to just free up some restricted horses, maybe a cat. bypass system? Airfilter? maybe do the carb suggestion. My mechanic is tormenting me with doing a 3.3 turbo conversion, but thats going to cost me some serious dough that I cant spend on the car right now.... ...hey wait a minute, I could sell that useless peice of American car (Ford Focus) I have... lol that would give a an extra 11k... would that be enough? Keep posting, I am reading all the details. I will through some of this by my mechanic, see what he says. Thanks again guys, you really are super helpful! Luke is correct. The cost of the case was 2K then I had to have it machined for the updates. You can buy useds Ps...maybe and cams at least 600.00. The head work if done right at least 800-1000 or so with valves. Maybe more. It is not cheap. The cost of SSIs is a lot to begin with. Then the muffler. Lord I don't want to think what I spent on this. Yikes. Actually we have thought about selling it since we have a 3.6 that we are fitting a blower on for the car. No 2.7 will make the power of a 3.3, unless you compare a stock 3.3 to a turboed or 2.7 or at least one with forced induction. The cost to build said steed would not be cheap. It would take good money to make that mod list happen. So at the end of the day the cost to do the swap (could be done for 11K) would make more sense. And could be made to pass smog. Then again I think our 2.7 would with the CO turned back. Last edited by Porschephd; 02-13-2006 at 06:44 PM.. So after all the valve cover cra* that they gave you last summer, you came back for more, Stephen. WELCOME back over here. Last summer, hell it is still going on. I am not one to ever give up Not in my nature. Anywhoo, here is the deal, I have come across a 3.0 turbocharged engine from a local shoppe. they want 5k inbetween the swap, is it a good deal? Or should I skip the coustomized turbos? Leave it up to the experts.... my fellow pelicans... Thanks for all the comments etc. they have been very helpful. Edward - if I were you, I'd stick with that 2.7. If it leaks, good: at least you know there's oil in it. And at the bottom end of the revs, I'd wager a 2.7, even one milder than yours, would leave a 3.0 turbo in the dust as the 3.0 turbo is probably wondering what to do with all the exhaust air it's gulping up until at least 3,000 RPM, while yours KNOWS what to do at 3,000 RPM. Here's what I think - analyze what sort of driving you're going to do. Street, track, street/track combined, and think then of improving your gears. Those late-70s 915 gearboxes could always do well with some closer ratios. You could even swap in a 7.31 ring and pinion, which, I've heard can be like a virtual increase of 50 hp in your car. I see you also have a body kit on your car. How much do you think that weighs? Did it lighten your car or make it heavier? Remember, the 3.0 turbo engine is heavier than the 2.7 by at least 100 pounds. Also, if your engine has Webers, it's lighter still, as CIS injection is a weight penalty/performance loss. Also factor in that you "know" your engine. It's in good shape (I assume). Do you really want to trade that and $5K for something (as I recall the 3.0 turbos) that were somewhat high maintenance? All-in-all, I think you're ahead of the game with what you have. The body kit, it weighs nothing compared to the fatory stuff, and indeed it is noticable how much quicker the car is because of that, the lights are small and weigh nothing, the only thing I can think of having any weight left would be the AC unit, but that to is leaving, freeing up an additional 230-250 pounds. I will wait to hear what my mechanic says, but if i can get 50hp more from my 2.7 I will stick with it, I dont drive track, the car is more of a "ride fast and in style" kind of car... I will however take her to some tracks with other porsche poeple, but nothing serious, you know? Thanks DD74, I'm going to run that 7.31 ring and pinion mod by my mech! I have a slightly different take on this. Only because we have done so many of these swaps that the cost is inviting to say the least. First off never assume that a motor is healthy. NEVER NEVER. I would ask for a leak down and be present when this happens. Make them do it hot. I would offer to pay them for the time to do it. This way they are comfortable jumping through hoops. 5k installed as a swap is almost unreal. No way would or could I do it. Certainly not for a 2.7 swap. So I would make sure that the 3.0T is a healthy steed. If it is I would get the proposal in writing and do the deal. The 3.0T is worth more hands down. It will actually be less maintenance. If stock the motor ran lower compression than even that of the 3.3 turbo and ran lower boost. It has a stronger case (3.0 Carrera case) and obviously opens the door to more HP down the road. For example 400 to the wheels. Not a cheap venture, but my point is that motor will do it. The 2.7 not on its best day in this lifetime can do that. I agree, what are the goals. I would suspect that a motor to keep up with the body kit would be more to your liking, but I could be wrong. Everyone is different. For 5K that is more HP than you would ever get spending 5K on the 2.7. Consider this option wisely. This is a good deal if in fact the motor is healthy. Look for updates such as turbo and exhaust. You want to make sure the thermo reactors are gone. They are junk and add nothing but problems. In response to your 2.7 leaking. It will always leak if you have the mag case in there. They simply are spent by this age in life and no amount of machining or certing will keep that case from shifting and moving in time. They will seal for a short while then resume as normal. The cure and answer to that is using a 2.0 case. Which I have explained is not a cheap or deal either. Unfortunately the mag case from a weight standpoint was great, for a practical standpoint was terrible. Practicality is what his Ford Focus is for. Gotcha, but isn't a Posche more fun. Com'on drive those cars everyday! Com'on drive those cars everyday! Yes! It's the only way these cars stay together - daily driving. Unfortunately, I've been bannished to an SUV for the last two days. Talk about uninspired motoring.